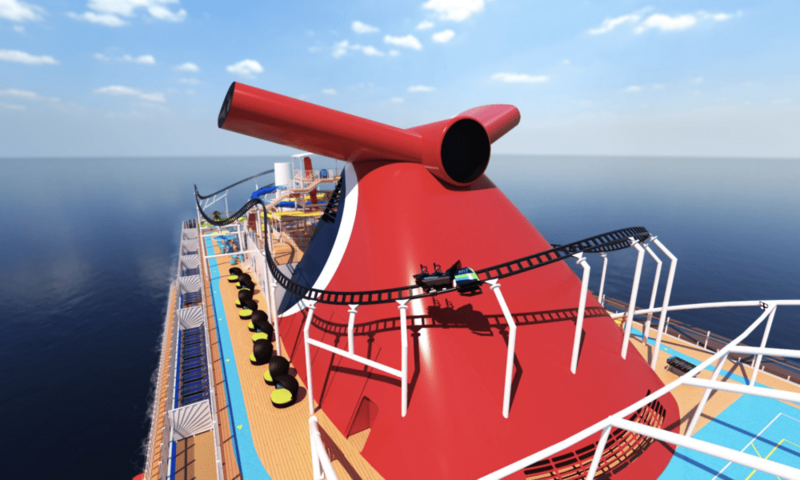 In an industry first, Carnival Cruise Line’s newest and largest ship will feature an open-air roller coaster unlike anything ever before seen. Bolt: The Ultimate Sea Coaster will offer passengers a unique thrill with surprises from start to finish – all from 187 feet above sea level. Photo rendering via Carnival Cruise Line. Built by Munich-based Maurer Rides, Bolt: The Ultimate Sea Coaster will begin with a high-energy launch followed by 800 feet of twists, turns, and drops culminating in a hairpin turn around the ship’s iconic funnel. The electric coaster can achieve speeds of up to 40 miles per hour while passengers ride motorcycle-like vehicles. And since they can choose the speed at which the vehicle travels, no two rides will be alike. Much like land-based coasters at parks like Universal Studios or Walt Disney World, Mardi Gras passengers can walk away with a great souvenir, since their pictures will automatically be snapped during the ride. When launched in 2020, Mardi Gras – named after the very first Carnival cruise ship – will be sailing from a brand new, state-of-the-art terminal in Port Canaveral, Florida. Details about the ship’s itinerary are expected to be revealed in January, with info on other features (including dining venues and other onboard attractions) sprinkled throughout the year. Meanwhile, work on a second XL-class will begin even as Mardi Gras is being debuted. While little is known about the as-yet-unnamed second ship, she will make her grand debut in 2022 – just in time to help Carnival celebrate their 50th anniversary. Itineraries will go on sale for Carnival Mardi Gras in January 2019.